New York State goes by the Title49 guidelines by the NHTSA. The good thing is that it's a federal standard. So, if I move to another state, I'll be OK. There is quite a bit to the code so I have delayed my inspection request until I can make sure the BugE complies with the code. I guess everyone needs a hobby. This for the moment is mine. -Still don't know for sure if NY will have a problem with the frame, body and wheels. I suspect they will find the BugE acceptable, but I don't know for sure. The case I'll be making is that 23 other states approved vehicles based on kit parts and so far, there have been no accidents due to structural failure. If NY rejects the vehicle on the basis of this, one has to ask, how many successful vehicles would it take? If I were rejected on this basis, I think I have a strong basis to appeal the decision although I have no idea how I would do so. As for the NEV limitation, New York doesn't restrict electric trikes to 25MPH. Instead, it insists all motorcycles (electric or not) must be able to EXCEED 40MPH! Yay! got that one! The kit provided tires I have are acceptable provided I can demonstrate that the weight does not exceed the capacity of the tires. "self canceling turn signal" mechanism providing 4-way flasher capability is nice, but not required. Replacing side headlights is tricky with two headlights, one for high beam, one for low beam. In NY the headlights can't be more than 8" across or there needs to be a center light. The center lamp should have DOT/SAE markings and also say "motorcycle" on them with hi/lo in the same body. Mirrors - the Eurosport mirrors look good but they were mounted a little too low. I'll be replacing them with Izuzu truck mirrors which will give a larger mirror area. Glad I wired in the turn signal indicator lights to the speedometer! At the time, I thought this would just be a nice, but not necessary feature for me. Turns out having turn signal pilot lights and an illuminated speedometer are both needed! right-left brake layout is acceptable as is and is also safer than stopping using rear wheel. If rear wheel locks, the vehicle could go into a spin! Oh, and there is also a quiz. Which lamps are DOT approved? Yes, in both cases, bigger is better. However, it's not the size that makes the grade. What really makes the lights legal is the DOT / SAE code on the lens of each lamp. FINDING authentic DOT/SAE stamped parts at any price is a challenge. 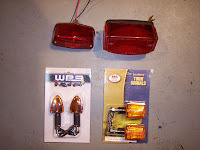 In my case, I gave up searching for a new tail light and just went with a 2nd hand part. This approach works, but the tail light I settled on is nearly 20 years old!